For over ten years, the Happy Santas have been bringing holiday cheer to our Padua House program! 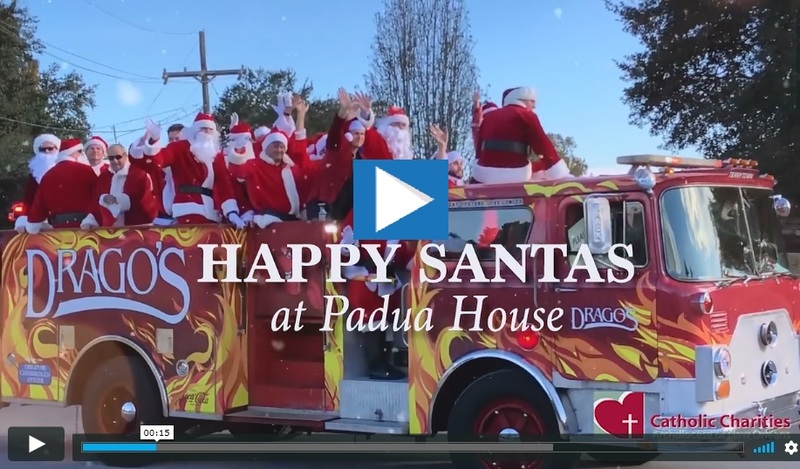 Perched atop the Drago's Seafood Restaurant fire truck with sirens blazing and in a L'Auberge limosine filled with Santa bags, they arrive escorted by the Plaquemines Parish Sheriff's deputies, ready to fulfill Christmas wish lists for Padua residents and clients. 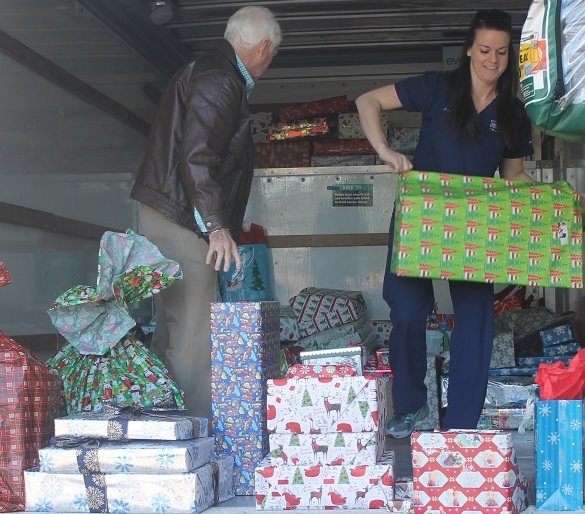 This year's visit was bigger and better than ever with more than 50 Santas! Watch our video to see why the Happy Santas choose to support Padua House, which serves developmentally and intellectually disabled children and adults, and what this special holiday tradition means to them! 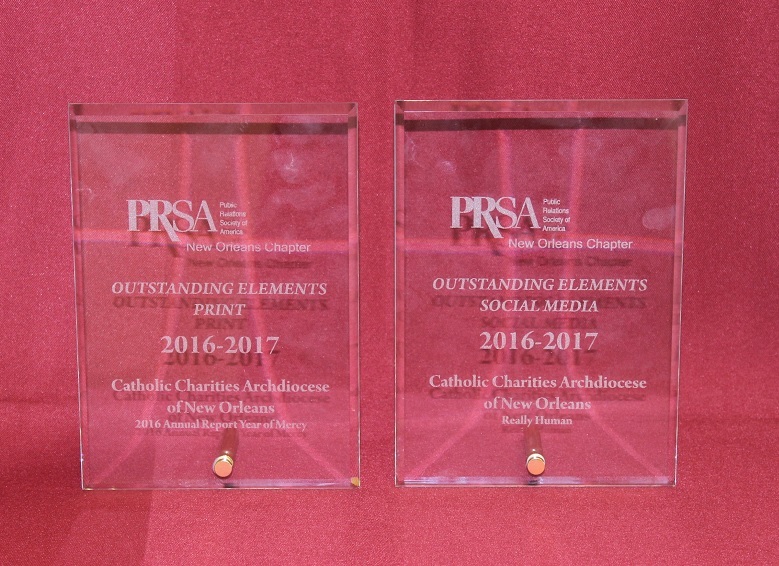 We're excited to share that Catholic Charities won not just one, but TWO awards at the 2017 Public Relations Society of America (PRSA) New Orleans Fleurish Awards Ceremony! We received the an Outstanding Elements in Print award for our 2016 Annual Report: Year of Mercy, which included reflections and stories about an unaccompanied minor, a formerly incarcerated individual, a foster family and more. We also received an Outstanding Elements in Social Media award for our video entitled Really Human, which follows the journey of Ihssan Sharbah. Ihssan worked as a translator and linguist for U.S. Forces in Iraq until it became too dangerous and he and his family were forced to flee. 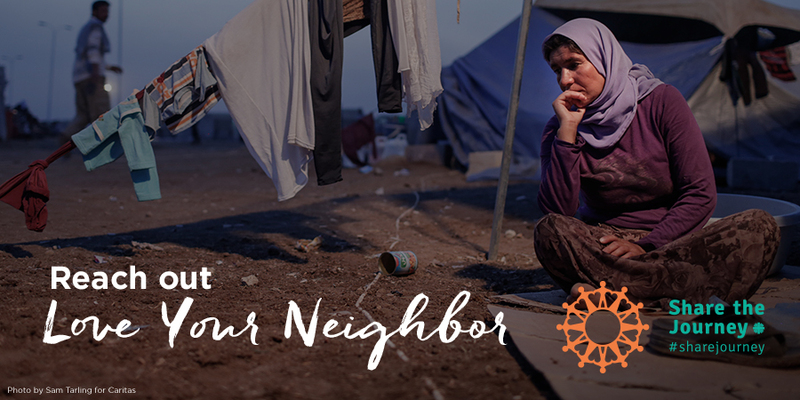 Pope Francis has called us to love our neighbors as we love ourselves by sharing a journey with them - neighbors who do not live near us, look like us or speak like us. During this season of Advent, we are reminded that the Holy Family was forced to flee their home and find shelter elsewhere, making them refugees, just like the migrants and refugees of today who are forced to flee their homes due to violence, war and persecution. Use the Share the Journey campaign's website to discover activities, videos and prayers to help you and your family find new meaning in the Holy Family's journey. Thanks to everyone who donated to Catholic Charities through #iGiveCatholic on Giving Tuesday! Not only did you help us raise $174,220 in just 24 hours, but we also received a $750 prize for receiving the second most gifts in the nonprofit category! Haven't made your gift to this year's Archbishop Hannan Community Appeal (AHCA) campaign yet? There's still time left to help us reach our $1.82 million campaign goal by the end of the year! Make your gift today to help CCANO serve the hungry, homeless, elderly, at-risk youth and so many more. Thanks to everyone who donated food, clothes, gifts and more for those in need this holiday season through our Thanksgiving and Christmas adoption programs!